Want to do something fun and adventurous? 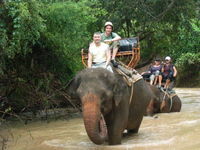 Why not go on an elephant ride and jungle trek tour from Pattaya. 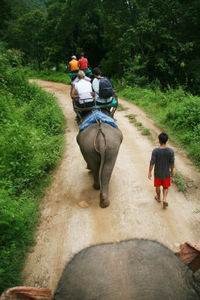 Enjoy a short trip riding one of Thailand's famous residents, the elephant. No trip to Thailand is complete without an elephant ride. Coral Island is a popular excursion from Pattaya. Travel a short distance by speed-boat and spend the day at leisure on this stunning island. Nong Nooch is renowned for it's beautiful tropical gardens and cultural shows including the popular elephant show. You'll have a choice of a morning or afternoon departure to enjoy Nong Nooch village. Travel from either the Bangkok Airport or hotel to your Pattaya Hotel. Transfer services are available 24 hours a day, 7 days a week. Choose between a shared vehicle transfer, and your own private vehicle transfer. Travel from your Pattaya hotel to either the Bangkok Airport or hotel. Transfer services are available 24 hours a day, 7 days a week. Choose between a shared vehicle transfer, and your own private vehicle transfer. 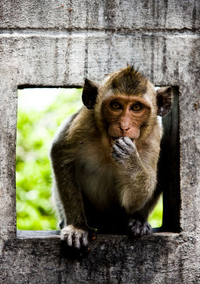 A varied half day tour where you will have the opportunity to see a lot of interesting aspects of Pattaya, including a local market, marine aquarium full of magnificent tropical fish, a cliff full of tame monkeys and an oyster farm. Discover the local Wildlife Park where you may observe the resident Tigers in their natural surroundings. There are opportunities to feed many of the other animals on site or have your picture taken with the newborn tigers.